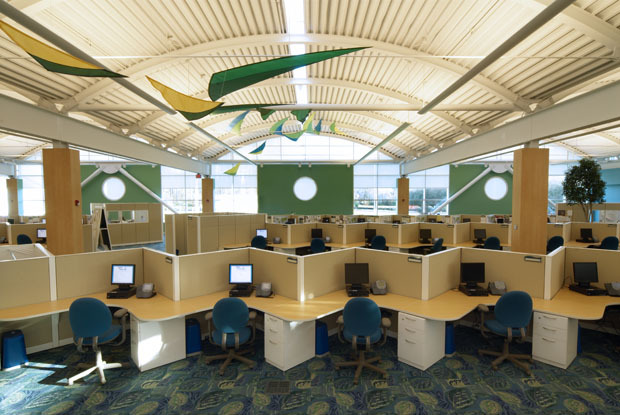 When constructing a call-center facility, owners have traditionally focused only on minimizing the cost per cubicle. But when Royal Caribbean Cruises Ltd. (RCL) broke that pattern, they did it with flair. 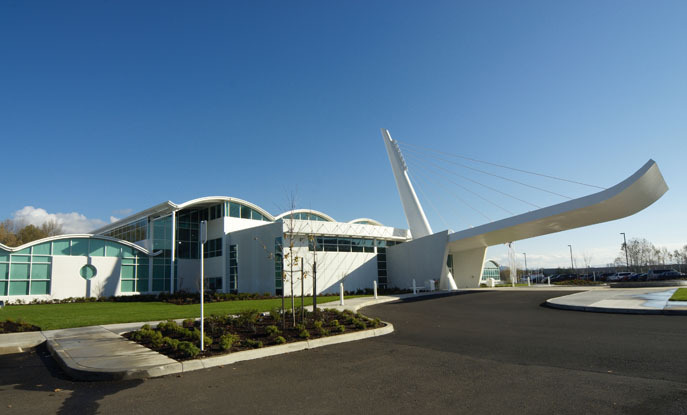 For its new call center in Springfield, Oregon, RCL directed architects to design a facility that would be not only friendly to workers, but to the environment as well. 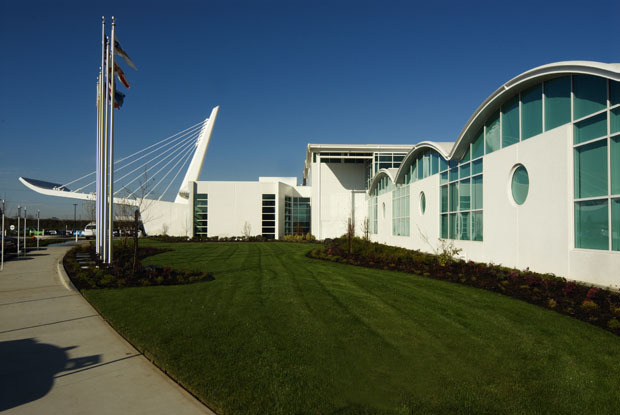 The resulting effort earned a Gold rating from the U.S. Green Building Council and stands as a jubilant testimony to the universal appeal of sustainable building. The design of the colorful, cruise ship-themed structure was driven by local interest as well as by Royal Caribbean. "The Oregon community is very green," says Jack Cottrell, CEO of Workstage, the Grand Rapids, Michigan-based developer and design-builder. "And Royal Caribbean believes that since they spend more on salaries than on buildings, as an employer they should offer a great place to work." 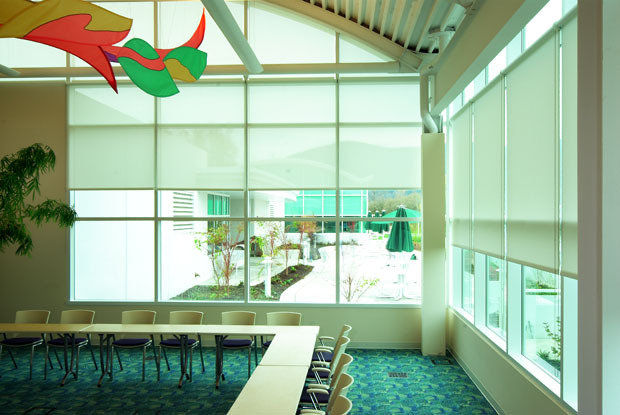 For the Springfield facility, this meant colorful and engaging interiors and a host of employee amenities, breathtaking views, and a full complement of environmentally and worker-friendly green features, including custom roller shades by Hunter Douglas. 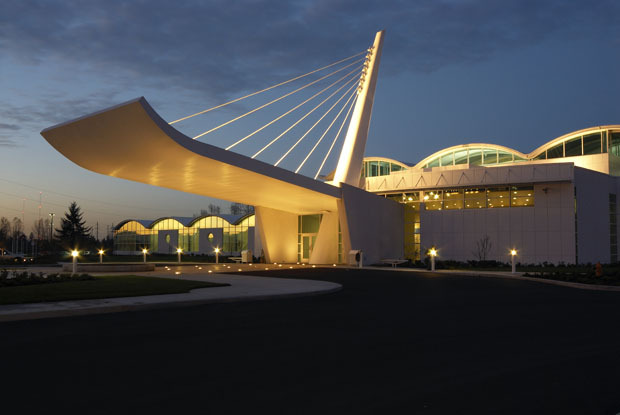 Designed by Grand Rapids-based Integrated Architecture, the 163,000-square-foot building comprises a single-story slab of open-office areas, topped by playful waves of barrel vaults. This main mass is bisected, north to south, by a two-story extension housing the entry lobby, cafeteria, library, fitness center and even an archival exhibit on the history of the company's cruise ships. All zones are served by an underfloor ventilation system with local controls so occupants can set their temperature and humidity levels. 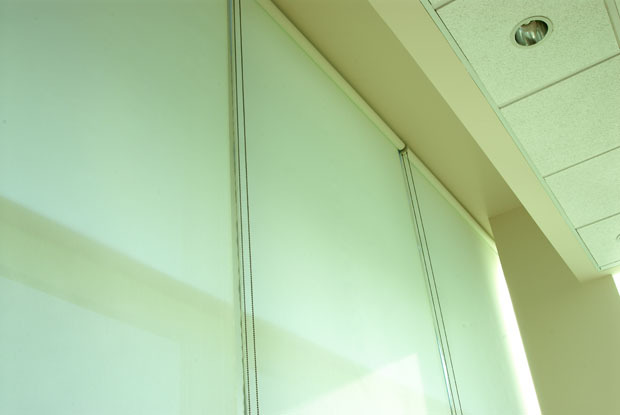 CO2 monitors optimize fresh-air ventilation through the raised floor. (Low-VOC materials, from paints and carpeting to composite woods, further improve indoor air quality.) A noise-canceling system improves acoustics--and, presumably, productivity--in the large office volumes. 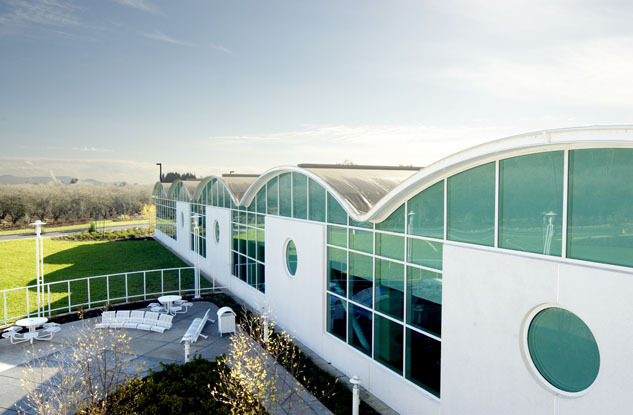 Besides the visual interest of the playful architecture, employees enjoy plenty of daylight and views of the surrounding woods. 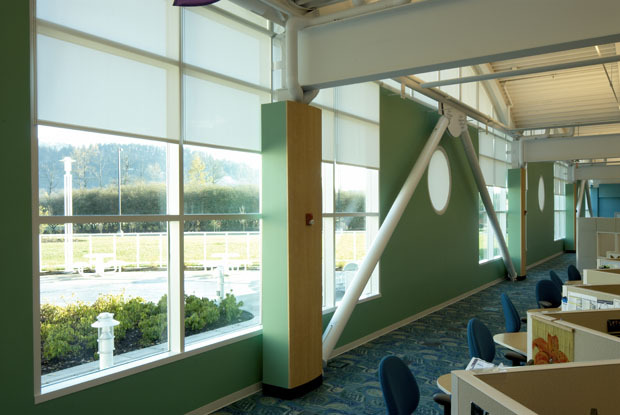 To control glare and brightness, they have direct access to the perimeter roller shades, which feature fiberglass-core fabrics in white. The selection of the fabric required special care. 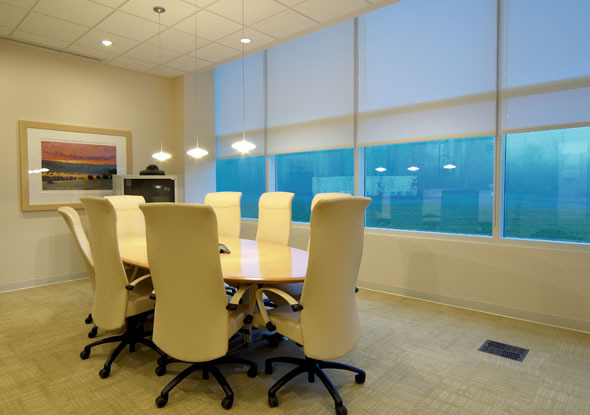 "In the conference rooms, we specified 3% openness factor for better light control, with 5% openness through the rest of the facility," said Aaron Manes, the dealer who completed the installation. 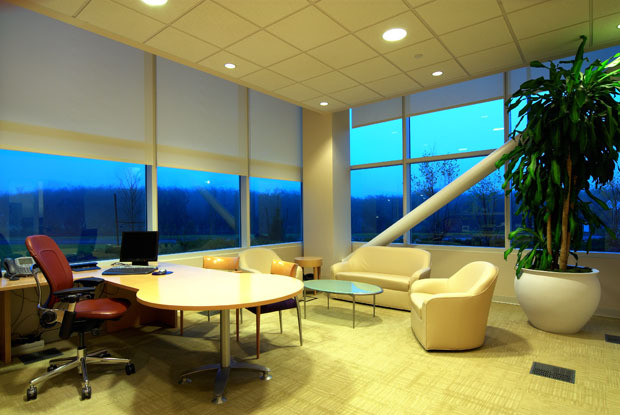 "That means the shades block up to 97% of ultraviolet light for superior glare control." Like the offices' telecom cabling, however, most of these performance-driven advances are hidden from view. 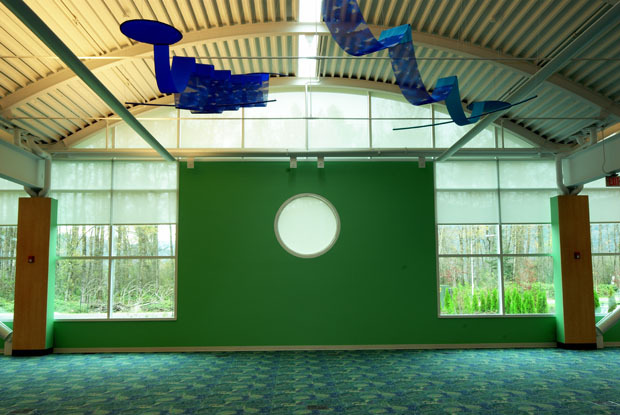 Instead, Royal Caribbean employees are greeted each day by a curving, cable-suspended canopy, porthole windows and an aquamarine carpet in a seaweed motif. 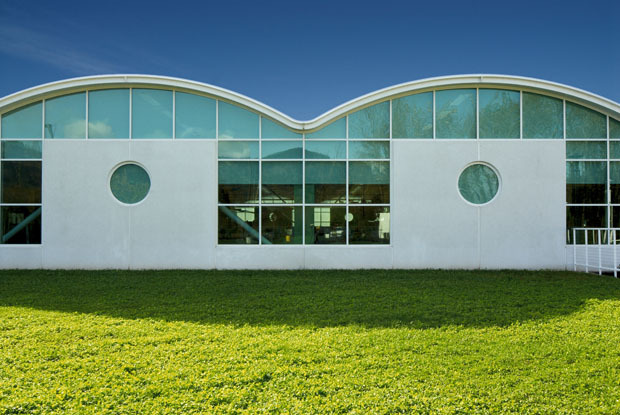 According to Chris Hagen, who managed the job for Hunter Douglas, "The architecture of the building --including the porthole windows and multitude of arches -- required a very skilled partner. For this project we worked with Aaron Manes of Aaron's Window Treatments... he has completed several similar projects and we trusted his experience and vision. "Further interest comes from skylighted barrel vaults, zigzagging workstations, a roof-deck plaza with picnic tables; in the cafeteria hangs a sea turtle sculpture from a daylit, wood-finished dome above a flying staircase. Natural stone and wood finishes, comfortable break furniture, and decorative mobiles overhead complete the picture. The construction is chock-full of green building factoids: 13% recycled materials, 66% sustainably harvested wood, 100% non-petroleum backup generators, 23% locally produced material, and water and energy usage 35% and 40% below code maximums, respectively. Yet these inward-looking accomplishments are easily eclipsed by the project's overall attitude toward the external environment. For example, though the call center is conveniently reached by car via two major highway corridors, the project team worked with transportation authorities to add a connecting route to a nearby transit center. At the office, carpoolers and hybrid vehicles get reserved parking spots, and commuting cyclists benefit from bicycle racks--and showering facilities. The site was also planned green: half was left as open space, restored with native plantings. Bioswales, catch basins and filtration media treat storm water on site, recharging the aquifer and protecting a nearby river from contamination; a "green housekeeping plan" also eliminates harmful chemicals from the wastewater stream. Thoughtful landscaping with minimal manicured lawn reduced irrigation needs to about 25 percent of typical. Last, through an agreement with a green energy provider, all of the building's loads are supplied by renewable sources, such as wind power. "Royal Caribbean had already selected that site," says Cottrell. "So we had to treat it with respect and deal with water runoff, landscaping and everything to make sure that we left the site in as good a shape as we could when we were done with it." 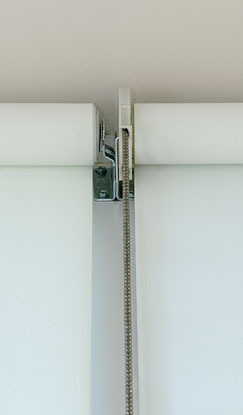 The construction process also reflected sustainable principles. More than 97 percent of the site's construction waste was diverted from the landfill and reused elsewhere. 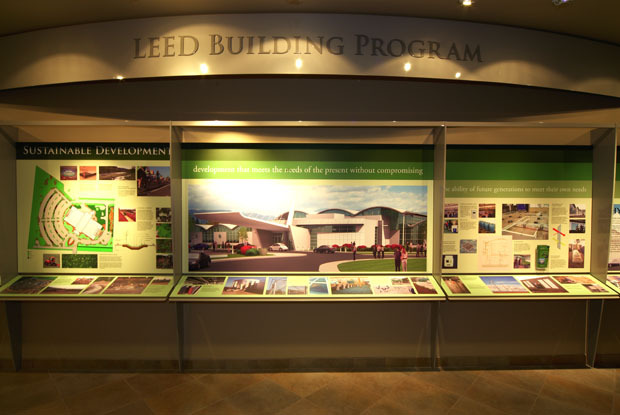 The project team also posted interpretive signage and conducted educational tours during the construction phase to educate the public on green building technologies. 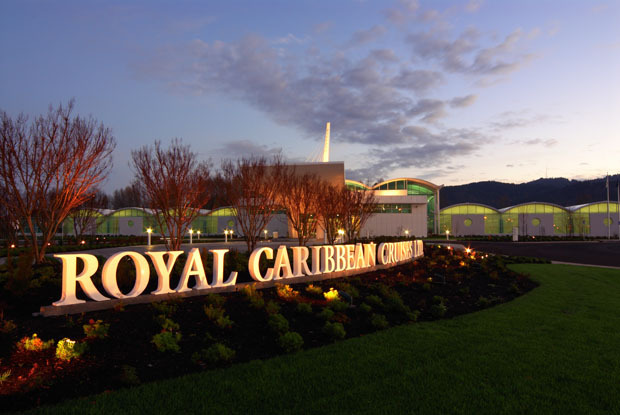 Thanks to these efforts, Royal Caribbean earned the Gold level for LEED NC 2.1, the second highest possible accolade. 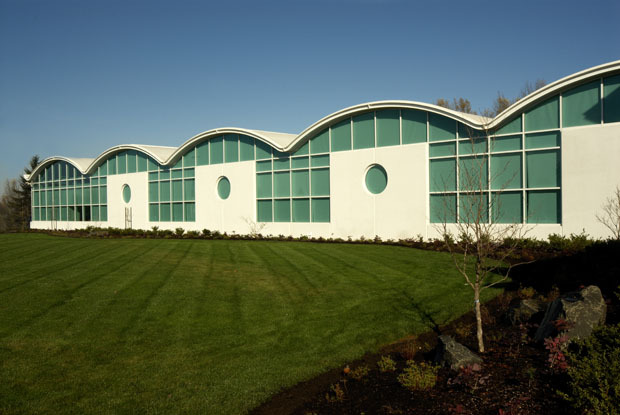 That makes it one of only a dozen Oregon buildings to hit that level--and the first call center. "Our plan all along was to build a LEED-certified building," said Russ Bogue, Royal Caribbean's Director of Facilities Management, in a statement to the press. "As we got into it, we realized that with the things we were doing, we probably could qualify for silver. But in the end, we got the gold."